I love easy dinners. I love easy dinners that taste like I put a lot of effort into making them. This recipe is so simple and tasty my family truly loved it, even my husband who is not a huge fan of chicken. The addition of bacon, amazing, the garlic slices, I loved, the olives, yum. Everything baked here is delicious. I used chicken legs here today, but feel free to use 8 x 200g chicken thigh cutlets instead. 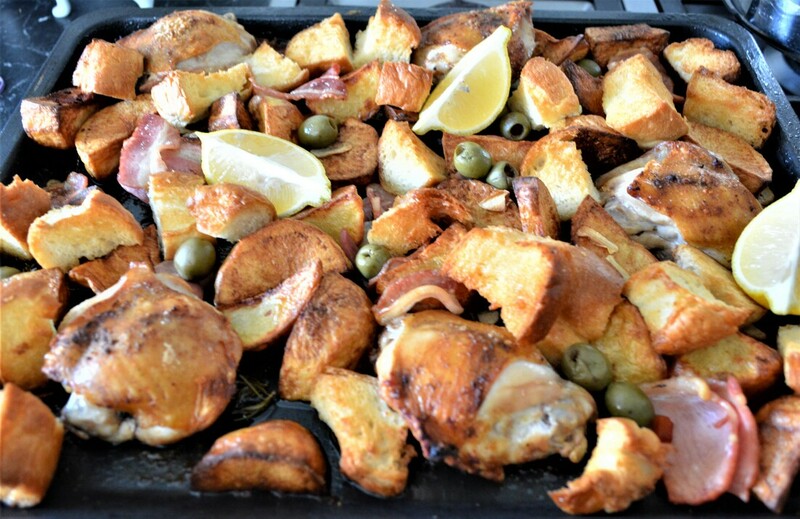 I also add croutons when I have bread I need to use up, just cut the bread up into large chunks, drizzle with olive oil, season with salt and add the croutons in the oven with the bacon, rosemary, garlic and olives. So this is how I bake this recipe, this is how we like to eat it. Preheat oven to 240C/220C fan forced. Drizzle oil into the base of a large heavy based baking dish, the oil should nearly cover the base of your baking dish. Add potatoes, season with salt and pepper. Toss the potatoes in the oil. Roast, uncovered, for 20 minutes. Season the chicken with salt and pepper, to taste, and lightly sprinkle with vegeta. After 20 minutes of roasting, toss the potatoes around, then place the chicken amongst the potatoes and roast, uncovered, a further 30 minutes. 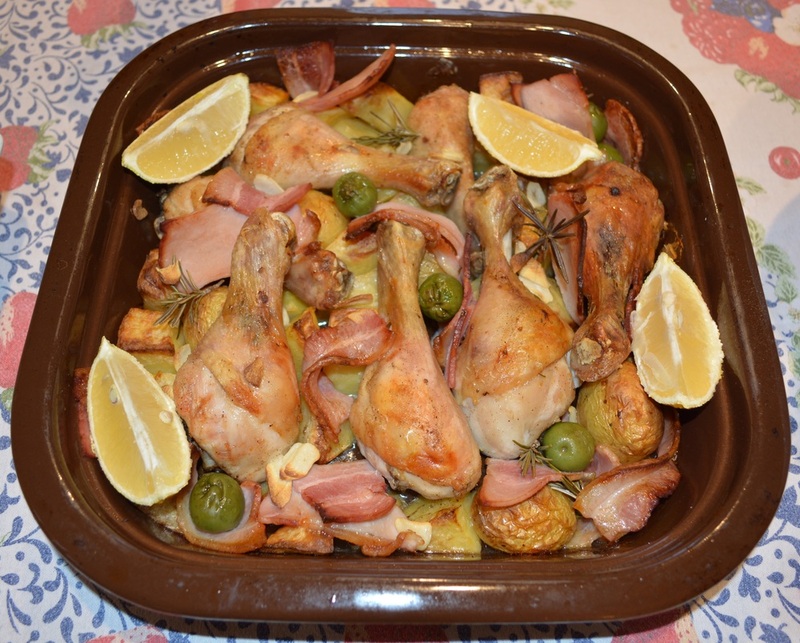 Scatter the bacon, garlic, rosemary and olives around the baking dish, roast a further 10 minutes or until browned. Serve chicken and potato with a green salad and lemon wedges.